This easy classic strawberry cheesecake recipe is so remarkably simple to make, and foolproof too! You can't go wrong when you make this "berry" delicious dessert! Combine graham cracker crumbs with 2 tablespoons of sugar and the melted butter or margarine. Press into the bottom of a springform pan. Cream the softened cream cheese with the sugar and vanilla extract. Add the eggs one at a time, beating thoroughly after each addition. Add the sour cream, which should be at room temperature. Pour into graham cracker crust. Bake for half an hour at 350 degrees F.
Turn off the oven, leaving the cheesecake inside for another half hour. Chill and refrigerate for at least 4-8 hours. Top with your favorite fruit topping, garnish with fresh strawberries or graham cracker crumbs. Note: This is my personal favorite classic strawberry cheesecake recipe. I make it in one bowl, and it is absolutely foolproof and easy! Since moving to Israel 28 years ago, I've had to adapt the style of cheese I use...but BELIEVE me....this is a great and easy cheesecake recipe. (When I told my friend, Arna, that I was planning this website, she immediately e-mailed me asking me...no, TELLING me to include this recipe.) Thanks, Arn! 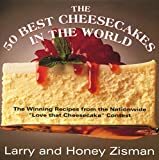 Become a cheesecake whiz by expanding your cookbook library. Best selections can be found at Amazon.com. Send me your recipe ideas! Click here for more recipes like this Classic Strawberry Cheesecake Recipe. Keep updated on all things strawberry by signing up for my FREE newletter!